Milana is a highly versatile and experienced Melbourne based fashion and wardrobe stylist. Over the years she has worked across many areas of fashion and styling- from design and marketing to styling for television and music videos to editorial and commercial work. 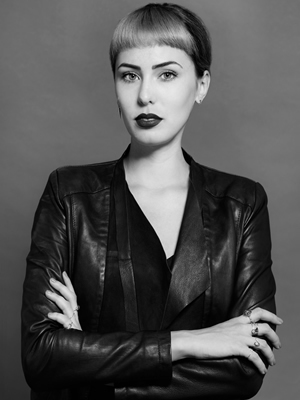 As well as her extensive experience, having worked with an array of aesthetics, body shapes, personalities and age groups, Milana posses an Associate Degree in Fashion Design & Technology from RMIT. She believes this helps to set her apart from other stylists as the degree has given her a deeper understanding and appreciation for fashion and garment construction. It has also provided her with skills and technical garment knowledge that enable her to design and create one off pieces for her clients where required. Milana’s aesthetic as a stylist can be described as timeless, traditional and intricate, however she also has an appreciation and understanding for commercial viability and mass market appeal. Some of Milana’s clients include Chumba Concept Salon, Hush Puppies, Toni & Guy and Basics India. My creative partner and I have had the good fortune of working with Milana on several significant projects, most notably the production of our original television series, “The Weatherman”. For over a year, Milana provided her invaluable services to the show as a Costume Designer and Head of Wardrobe, managing the responsibility of not only dressing the entire cast but innumerable other tasks across the show’s production. On the strength of the Australian production work, “The Weatherman” was later commissioned in the USA by 20th Century Fox and Fox Network, and many positive comments were made to us regarding the show’s production value and aesthetic by very senior industry professionals. Milana is a versatile, hard-working, passionate and very amicable woman with virtually limitless talent in her field. We would not hesitate to recommend her and would happily elaborate if required. Feel free to reach out to us at hello@renderr.com.au if you have further enquiries.